As many as 821 ganja saplings, spread over one acre of land, owned by a farmer Gudla Kumaraswamy, were ready for harvesting. 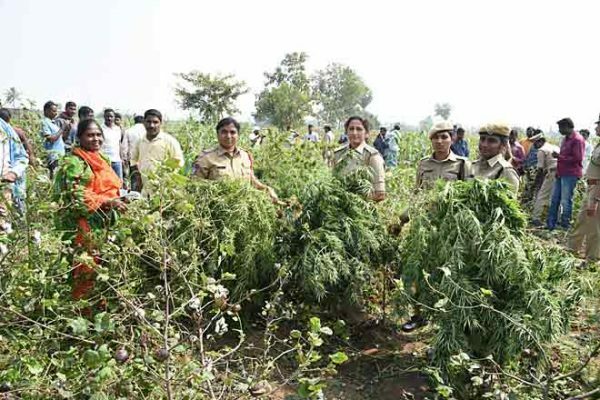 Police destroying the ganja plants being grown in a cotton field on the outskirts of Thummenapalli of Huzurabad mandal. Karimnagar: Huzurabad police and Saidapur Task Force raided a cotton field where ganja plants were being grown on the outskirts of Thummenapalli of Huzurabad mandal. The plants were set on fire by the cops in the presence of villagers. As many as 821 ganja saplings, spread over one acre of land, owned by a farmer Gudla Kumaraswamy, were ready for harvesting. A native of Ramachandrapur of Saidapur mandal, Kumaraswamy sowed ganja as an intercrop in his two acres of the cotton field between Thummenapalli-Ramachandrapur villages. Commissioner of Police VB Kamalasan Reddy visited the field and inquired about the cultivation. Speaking on the occasion, he said the plants were almost ready for harvest in the next one week. Cases under the NDPS Act would be registered on those trying to cultivate or sell ganja. Under the Act, the accused would not get bail up to three months, and there was a possibility of imposition of ten-year imprisonment if found guilty, he said. The CP advised farmers to destroy the plants if anyone had cultivated ganja in their fields. Drone cameras were also being used to trace out ganja cultivation, he said.